Gangtok being the capital city of Sikkim is the most populated area of the State. 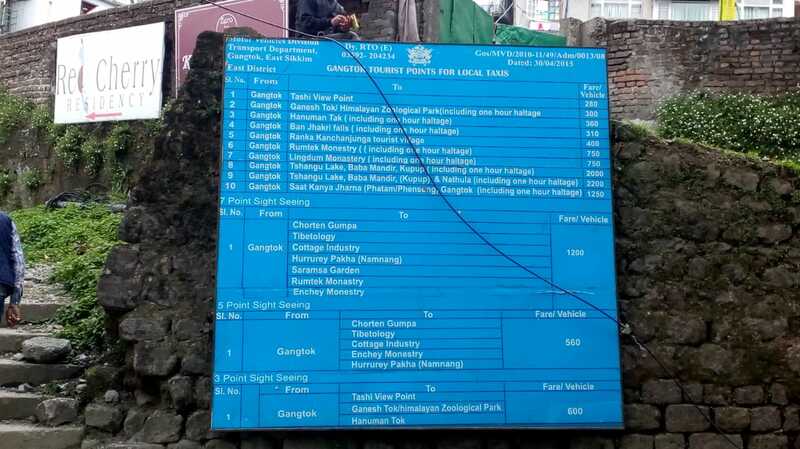 And if one wants a budgeted itinerary, one should opt visiting Gangtok on their first day. Visit Gangtok on the first day and try to avail a hotel in the M. G. Marg market area as the taxi stands are located there and all four districts are easily connected to Gangtok. Availing hotels near the market has an extra advantage of shopping- you can visit the market whenever you want. The traffic there is one way so taking a hotel someplace else would increase your to and fro journey fare. 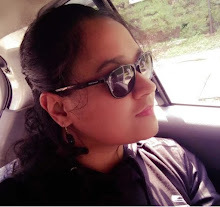 If you are bored in your hotel room you can go for a stroll too.Also on the first day itself connect to the local tour operators at M. G. Marg or at Vajra Taxi stand to visit the districts. The altogether hiring cost is much high compared to the local touring. The talking is to be done on the day one itself as you would need permits to visit the border areas, namely North and East Sikkim. Reaching Gangtok by noon will provide you much time for the first day local sightseeing. Avail a taxi from the local taxi stand and visit Enchey Monastery at a fare of INR30 per person. Coming back head to Deorali Bazar, where you can visit Namgyal Institute of Tibetology and Do Drul Chorten (closing time- 4:00pm). It’s a little uphill and needs little walking. Coming down towards the main road you could get the ropeway, hop in and go to M. G. Marg (ticket at INR 117pp). Although it’s a to and fro journey, however it is better to get down after one trail as that would save the taxi fare or the toil if you choose to walk. And then spend your whole evening at CCD or Baker’s café or walk around the marketplace. Do visit Café Sass and Guff to have a bird’s eye view of the night lit city. The local sightseeing is categorised as 5 points, 7 points and 10 points with the charges as Rs 1200, INR 1500 and INR 1800 respectively. The notable points include the Rumtek Monastery, Ranka or Lingdum Monastery, Tashi View Point, Ganesh Tok, Hanuman Tok, Banjhakri waterfalls, Bakthang waterfalls and Sikkim Himalayan zoo. Try out the Sikkim attire for a few minutes for a rent of INR 50 for a photographic memoir. Try to finish off by 5:00pm as the places get closed by then. Get hold of a driver on the day before as that would save you time on Day 2. Start off as early as possible in the morning to cover all the places. And yes try to memorize few words in Nepali. Trust me it helps a lot. On the way to Nathu La, you would come across two lakes, namely Nathu La Lake and Tsomgo/ Changu Lake. The physical state of the lake varies depending on the season of your visit. You would be mesmerized by a frozen lake during November to Mid-April and a watery clean lake for the rest of the year. And yes, all through the way the snow covered terrain would keep on fascinating you. Nathu La marks the border with China; the terrain is windy and one might have a bit of breathing difficulty here. Walking at a light pace and avoiding any rigorous activity would minimize that. Visit the memorial Harbhajan Singh Baba Mandir and return to Gangtok by evening. Get up early as vehicles are not allowed after 10:00 am to cross the checkpoint to Nathu La. This is one long and tedious journey through trees, waterfalls and tunnels. On the way you would come across Butterfly waterfall where it is said that in autumn it is a dwelling of colourful butterflies. The road bifurcates at Chungthang, one towards Lachung and the other towards Lachen. Lachung valley is situated on the banks of Lachung Chu River and is the gateway to Yumthang Valley. The destination is the Zero Point or Yumsamdeong where it is numb cold, you can feel your fingers getting frozen even inside the gloves but the view is breathtakingly beautiful. Play in the snow, make a bunch of Olafs, well you will not run short of snow here. And yet again a word of caution, since it is a high altitude place, some excited jumping would easily drain you out. So whatever you do, do it in a slow pace. The journey is through the Yumthang Valley Natural Reserve which is known for rhododendron blooms, though that has to be in the month of April-May. The varied coloured blooms are a delight to the eyes. In between you can have your favourite momo and cup of tea. Get the boots at Yumthang for INR 50, you will need it in Zero Point. And also bring a flask so that you can carry tea along with you. And preserve nature, do not litter the grounds with plastic disposal. Katao is towards east of Lachung while Yumthang and Yumsamdeong on the northern side. It is a military area and the peak i.e. Mt. Katao is not literally visited. However one can view the Lachung valley from the top. The road detour includes few waterfalls, streams and of course snow. From thereon straight right ahead to Lachen. 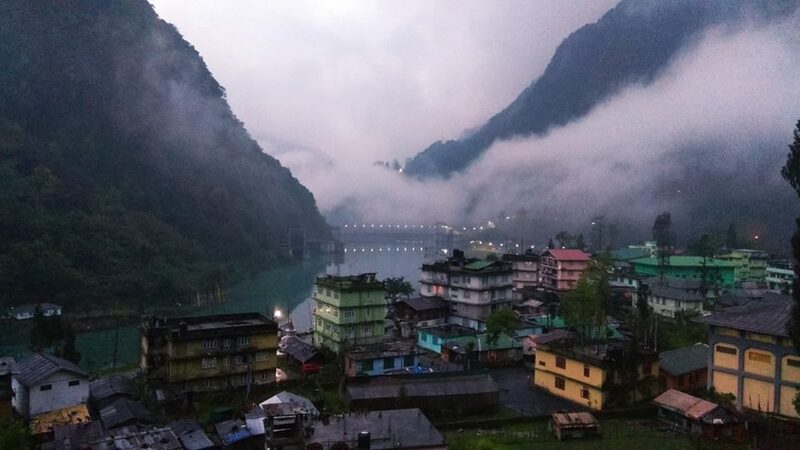 Since you are staying an extra day at Lachung, get up early in the morning and trek down to the Lachung Chu river side on the first day and visit the Lachung Monastery on the second. You will have your morning walk and could make the most out of your visit. Well save the best for the last. Get up early around 4:00 am in the morning. You are supposed to reach Gurudongmar before 10:00 am after which it is not allowed as it gets too gusty out there. The lake is situated at 17.300ft; a glacial lake and if you visit during February-mid April you would find a frozen lake. The road to Military base camp is too jerky, however beyond that the road runs through rugged terrain surrounded by white snow-capped mountains and the journey itself becomes beautiful. On a slightly unofficial note, try visiting Tso Lhamo Lake which is beyond the Gurudongmar road. The permits are not available, hopefully someday it will be. To be honest I have not visited myself but someday I hope too. A slight detour would take you to Kala Patthar, as the name suggest that it is a black rocky mountain all covered with snow. The view from there-on is seriously spectacular. It is snow, snow, snow everywhere, you can even slide in the snow here. The return journey to Gangtok from Lachen is tiresome. Pre-book a hotel at Gangtok because all you need is a good sleep for the next day’s journey. From Gangtok, head out for Temi tea Garden, Sikkim’s internationally famous organic tea garden where the road looped through stretches of the tea garden. If you are visiting in October-November you will find cherry blossoms along the roadside adding to the hues of green. From there-on head for Namchi and be prepared to be awestruck by the majestic view of the mighty Kanchendzonga all through the road. The notable point are Chardham and Smadruptse and come all the way back towards Ravangla. The journey ends by visiting Buddha Park or Tathagatha Tsal at Ravangla. All three places showcases large statues of Hindu-Buddhist Gods. This is a spiritual trail amidst the greeneries and clouds. From Ravangla travel to Tashiding and on the way you would come across Bon Monastery. 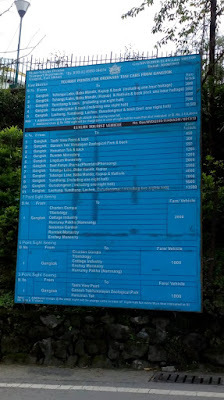 Then head for the Rabdentse Ruins which was the first capital city of Sikkim. The ruins are at the end of a trail which you need to trek. 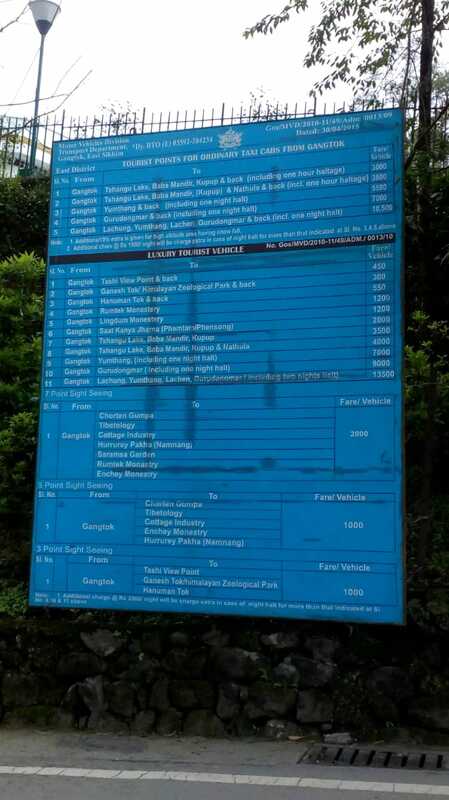 On the way there is a bird sanctuary which is structured like a Jurassic Park like structure. Therefrom visit Peymangste Monastery and Khecheoperi Lake. On the way to Pelling you will come across Kanchedzonga waterfall which is again the main attraction of Pelling. Yuksom is another small village on the hills, it is the base of most of the treks at Sikkim. If you are up for Goechala, this should be your destination. The day would end by your visit to the Phamrong Falls and returning to Ravangla. Beside the Phamrong falls, take the stairs and trail all to the top to enjoy an all-yours time in the fading light of the sun. Trust me, you will enjoy the effort. Take the bus at 7:00 am from Ravangla market. 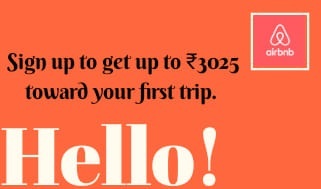 That would give you time to replenish your vacation even at the way-back-to-usual-blues journey. So are you up for backpacking Sikkim and worried about the essentials to carry? Here are the helpful tips on how to backpack northeast India! What a great place to visit! I love your photos! OMG this is breathtaking, I love snow... I have been behind my husband to convince him for a bike ride to Sikkim :P... let's see if he agrees... this is really amazing! So much great information! Thanks for adding in so much detail. These look like wonderful places to visit. I love all of your photos, but I think the Gangtok Nightscape is my favorite! Thank you. That is my first try on night photography, so that is my favorite too. I can't believe we can visit these many places in just more than a week. The sites are spectacular. I wish to have such a trip as soon as possible! Wow, Sikkim looks like a dream! The pictures you shared made me want to travel here all the more! Great pics! This looks like a fantastic trip. Great scenery and so vivid! Love it. The views in the valley are so wonderful. I hope you had fun. I loved all these views. I was talking to a friend about a trip to Sikkim just yesterday and was talking about budget. Thanks for this post, sharing it with her right at this moment. Your photos are amazing. I cant wait visit Sikkim soon. Thank you for sharing the guide. These pictures are beautiful! I'd love to visit. Thanks so much for sharing - I may put a couple of these things on my list! Si planeas quedarte en Curacao más de 3 días, alquilar un coche es una necesidad. Hay transporte público en Curacao, pero funciona regular, cada 2-3 horas y no puedes llegar con bús a todas partes. Algunas playas están demasiado lejos.